Introduction: Gastric cancer (GC) is the second most important cause of death by cancer in the world. In the last years, laparoscopy has been applied in the surgical treatment of GC with good results in early gastric cancer. However, differences in costs between laparoscopic and open surgery remain unknown. The aim of our study was to compare costs between these two alternatives in the treatment of CG. Methods: a descriptive study of all patients undergoing resective surgery by CG from January 2005 to December 2008 was undertaken. They were divided into two groups according to the type of surgery (group 1 = laparoscopic and group 2 = open) and obtained the values of their accounts disaggregated by the following items: 1) intervention 2) inputs 3) bed occupancy and health care 4) other. Results: We conducted 123 gastrectomies, of which 33 (26.8%) were laparoscopic. Laparoscopic and open groups did not differ in age, gender, ASA classification and tumor stage. 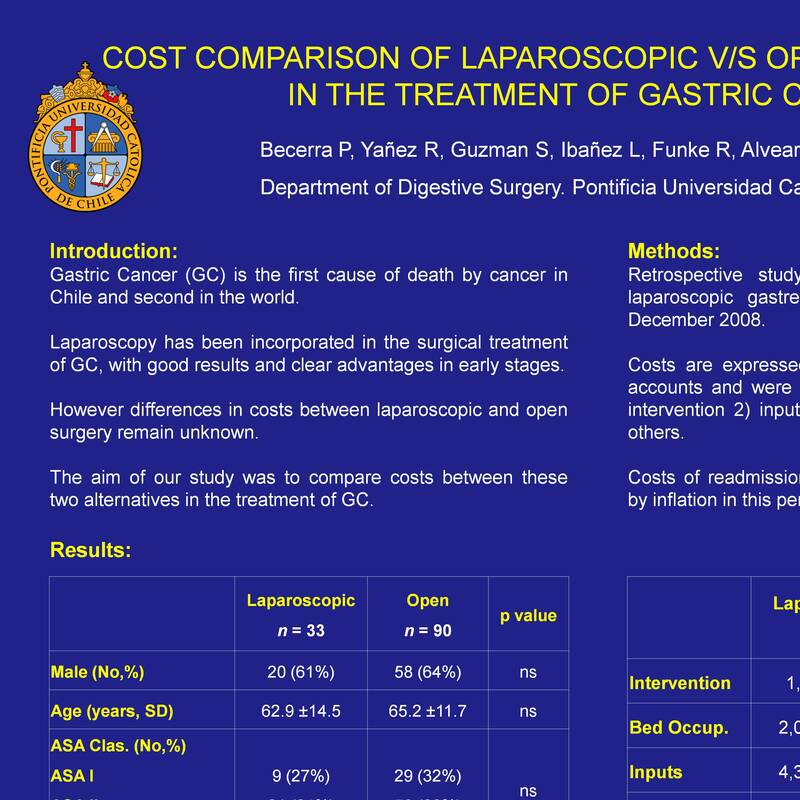 There were no significant differences in total costs between the laparoscopic and open group ($ 10,291 v/s $ 10,356, respectively, P = 0.96). However, the item "input" was significantly higher in the laparoscopic group ($ 4,320 v/s $ 2,938, P = 0.001), whereas the item "bed occupancy and health care" was significantly lower in the laparoscopic group ($ 2,068 v/s $ 3,450, P = 0.007). Conclusions: This study could not establish differences in total costs between laparoscopic and open surgery in the treatment of CG.